On September 4, 1781, the eleven men, eleven women, and twenty-two children recruited by Alta California Governor Felipe de Neve founded El Pueblo de la Reyna de Los Angeles (The Town of the Queen of the Angels). They had gathered in August at the Mission San Gabriel in New Spain (present-day Mexico) and traveled together to arrive at the site of the new pueblo alongside the Los Angeles River. Located between the San Gabriel Mountains and the Pacific Ocean, El Pueblo, as it was called, remained independent of the United States until the Mexican War in 1846, when the city was taken in a bloodless effort by U.S. forces. On April 4, 1850, the city was incorporated as Los Angeles and designated the county seat of Los Angeles County. The city grew considerably with the arrival of the railroad in the mid-1870s allowing both the easy export of agricultural products and an influx of immigrants. During the 1880s, the population of Los Angeles more than quadrupled—increasing from approximately 11,200 in 1880 to 50,400 by 1890, and then doubling to 102,500 by 1900. El Pueblo de la Reina de los Ángeles was the town founded in 1781, which eventually grew in the twentieth-century into the metropolis of Los Angeles. 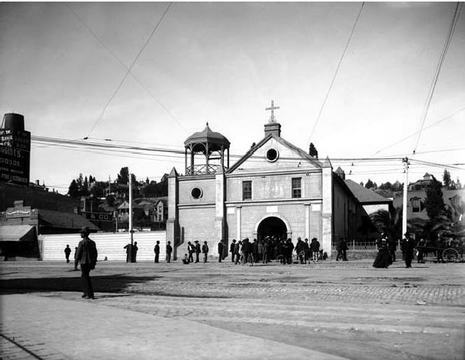 Los Angeles was the second secular town created by the Spanish in Alta (Upper) or Nueva California after more than a decade of establishing missions in the area. The original settlement consisted of eleven families recruited mostly from Sonora and Sinaloa. As new settlers arrived and soldiers from the surrounding presidios returned to civilian life in Los Angeles, the town became the principal urban center of southern Alta California, whose social and economic life revolved around the raising of livestock and the ranches devoted to this.